We are always here to help, should you have any questions when picking out your suite, feel free to reach out via email. 01. Our Semi-Custom Collections were carefully designed with both the modern and traditional couple in mind. Select the suite that best fits the mood and style of your wedding and the options you would like to order. Options include quantity, paper type, print type, printing color, envelope color and calligraphy design. 02. Select the other parts of the invitation suite that you will need. Decide on any embellishments you would like to add to your invitation suite. Embellishments options can be found on our Embellishment page. These include calligraphy addressing, wax seals, etc. 03. Contact us! When making your selections we encourage you to chose carefully. We will contact you within a few business days with your custom quote and request all content for your suite. Once your content has been received you will receive a digital proof within 5 - 10 business days. 04. Upon review of your digital proof, you may either approve or request changes. One digital revision round is included for minor changes to text and calligraphy. Any additional changes will incur a fee. Visit our Terms & Conditions for more information. Once everything has been approved production begins. We will follow up when production is completed and goods are ready to ship. High quality inkjet printing on paper. This type of print is available exclusively on our 110 lb cardstock paper. Digital printing displays on light colored papers only. Darker paper colors are not available with this type of printing method, as it does not show. When this option is selected, the return address and reply address will both be printed digitally on the envelopes. Also called relief printing, this process produces a textured impression, allowing you to feel every letter and illustration on the paper. Letterpress is commonly done with ink color, but can also be done without as a blind impression. Dark paper colors are not available. This method is available on our 110lb cardstock, 220lb cotton paper, and handmade paper. Both return address and reply address are letterpress printed. Similar to letterpress, this printing process applies metal dies to paper with pressure. The dies are heated and then stamped with a thin layer of foil to the paper, and foil color is applied individually through multiple runs of the press to create the final design. Perfect for both dark and light cardstock colors, this type of printing is available on our 100lb cardstock, 220lb cotton paper, or our handmade paper. Both return address and reply address are foil printed on the envelope. 110lb Cardstock Paper comes in a soft white color with light texture. It is the perfect choice for digital printing. For colored paper upgrades, we would use this stock and duplex the paper, making it thicker. 220 lb Cotton Paper is a gorgeous, thick paper with a soft eggshell finish. 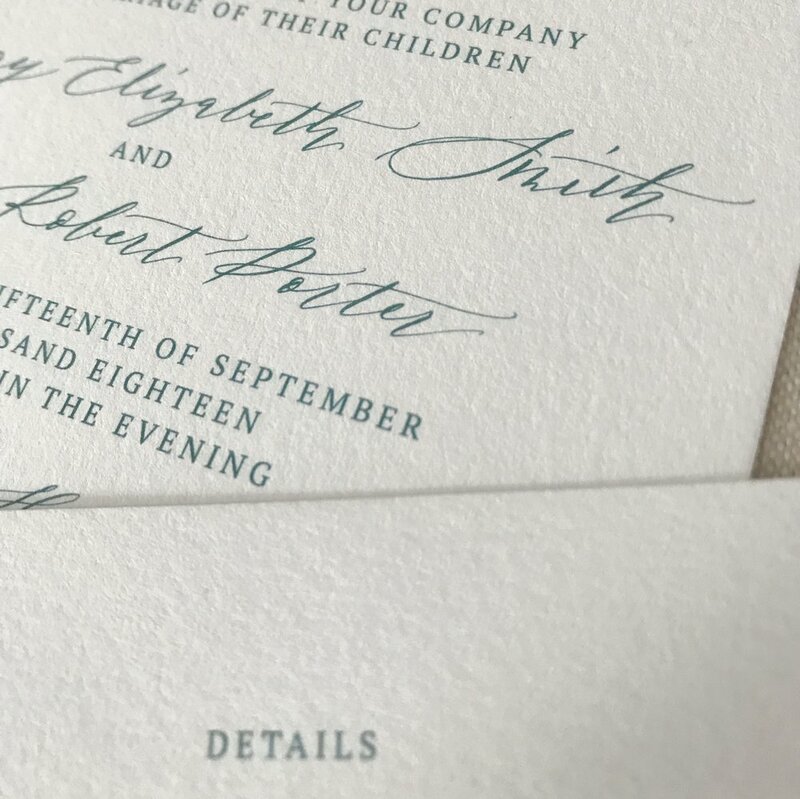 It is a wonderful match for both letterpress printing and foil printing. Handmade Paper features a natural texture and has a soft deckled edge. Letterpress and foil printing available with this option. Note: white handmade paper is more of a natural cream color than a bright white. Chose from one of the colors below for digital or letterpress print. Please note: linen and blind impression are available for letterpress print only, digital print is not available for these two colors. Chose from one of our signature calligraphy styles below. Paperweight calligraphy is handwritten and specially designed for you and your specific suite. A timeless calligraphy script. 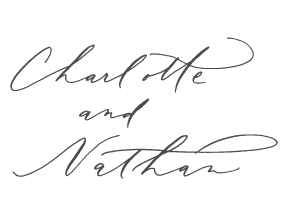 Chloe is a combination of traditional letter form with light flourishes. 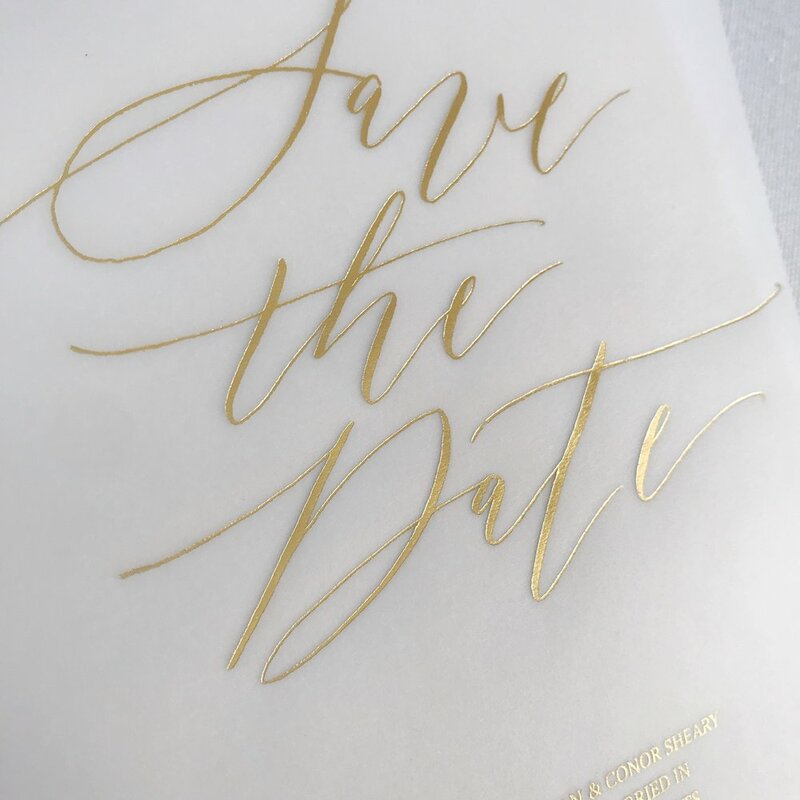 A beautiful and modern take on a traditional calligraphy script. Flora combines slender rounded letters with delicate flourishing. Long and simple capital letters mixed with a playful lowercase script. Letters have varied lifts and sizes. Perfect for the couple that is wild at heart!